I have a treat for you today. Stampendous and Carmi Cimiata are teaming up all week to show you some great projects using Stampendous stamps and EnviroTex Craft Resin. Carmi Cimiata runs the viviacious Resin Crafts Blog where she explores the most amazing uses of EnviroTex Craft Resin. If you've got some time, take a walk through her projects, they will astound you. Moreover, she makes it look so darn easy so I had to give it a try too. Of course any time Stampendous teams up with someone there are always Prizes!! Carmi has 3 prize packages that can be won by our fans in Canada where she lives. She will draw three Canadian winners from the comments on her blog all week. Stampendous has three prize packages for our friends with US mailing addresses. Each prize package from Stampendous will include a jewelry pack of Resin, a bottle cap, bezel and button to try, and the Stampendous Charm Collection Perfectly Clear Stamps - perfect jewelry sized stamps for your crafting pleasure! I used this set in my sample today. The resin is super easy to use. I even added a gem after I stamped a piece of blue paper with both red and black inks. Stamp, stamp, cut a rectangle, add a gem, add the resin and wait. Easy peasy! We'll draw one winner from the weekly comments on the Stampendous blog. We'll draw one winner from the comments on Saturday's Big Blog Hop. We'll draw one winner from Facebook - You'll want to SHARE one or more of our posts about this project on your Timeline. So who else has made something fun for us today? Visit them, leave some love! Win some cool stuff! I love resin and stamping in jewelry. This made a great necklace. Off to facebook to share. I may tweet too! Fantastic, Susie! That Charm Collection set is just the perfect size! Love it!! Susie, this is adorable! I love the image and the colors you used. It's really pretty. Lovely little necklace. 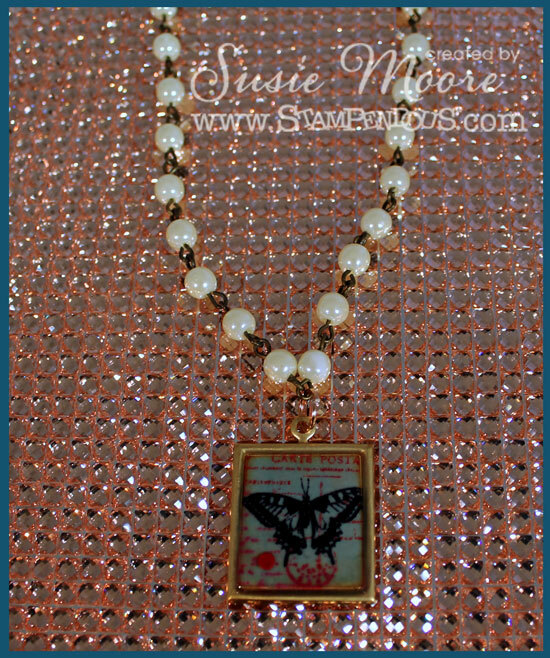 I like the butterfly image and how you kput it together with the round beads. TFS. This looks like the perfect project to do with my daughter! can't wait to see what else you guys have to show us! Wonderful pendant! The resin can be addictive, can't it? That bezel is so perfect! Just like something I would pick out to purchase for myself! OOOO.....love it Susie!!! Great job!!! I can't wait to see what you do on Saturday!!! I haven't tried any projects with resin yet, but after seeing your lovely creation I'm sure gonna give it a try soon! So very lovely! 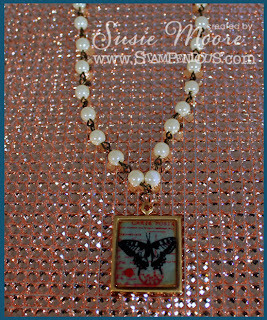 Sweet charm and love the necklace you paired it with! Beautiful! Such a beautiful necklace. The charm you made goes perfectly.